Wet carpet must be dried quickly and in a professional manner as approved by the international Institute of Inspection Cleaning and Restoration Certification (IICRC). If flooded carpet is left saturated it can cause other costly damage to your home or business. Mould is something that is a common problem when flooded carpet is left saturated for too long or is not dried properly. This type of secondary damage is obvious to many people living in Melbourne who are affected by water damage. But what many people do not consider when they have water damaged carpet or wet floors is that the water quickly starts to soak and seep into other surfaces it comes into contact with. Regarding your walls it can quickly move into your skirting boards and travel up your walls. 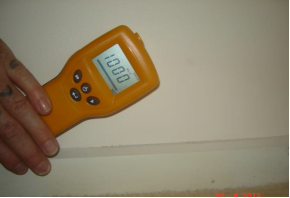 Before you know it you have water damaged walls and skirting boards in your home. The photo opposite shows that a wall is saturated with water, at a reading of 1000. This secondary water damage was the result of wet carpet that was dried using towels by the home owner. This damage was not obvious to the home owner. Professional water damage restoration technicians were not called until three days after the water damage had occurred. Within three days the problem got much worse. Our team of professional Water Damage Restoration Technicians will make sure the best restoration program is put in place for your water damaged home or business. We use the best practice equipment to access the damage, including that which is not obvious to the naked eye. We can then execute the most effective wet carpet drying and other water damage restoration program to stop and repair all damage identified. At Capital we consider wet carpet to be an emergency. When we receive a call about flooded carpet we are able to be on site in Melbourne within an hour in most cases. Call us 24/7 on 1300 554 418 to access our water damage restoration service in Melbourne. This entry was posted in Water Damage Restoration and tagged water damage restoration, water damaged carpet, wet carpet cleaning by admin. Bookmark the permalink.